The suit filed by former Governor Olusegun Oni, challenging the propriety of Dr Kayode Fayemi being nominated the All Progressives Congress (APC) candidate in the July 14 governorship election in Ekiti State is causing a lot of fear, suspicion and discontent in the party in Ekiti. Findings by pur correspondent revealed that a number of party members and leaders are at each other's jugular, as none is sure of what the outcome might be. There are even speculations in some quarters that Oni's former personal assistant, Bunmi Ojo, who was assassinated two weeks ago, was killed on account of the suit. The deceased was said to be the brain behind the filing of the suit and reportedly turned down pleas by some party leaders at a meeting to withdraw the matter from court. The suit, which has been slated for hearing in the first week of September by a Federal High Court in Abuja, is seeking the substitution of Fayemi's name with that of Oni, as the legal candidate of the APC in the election. 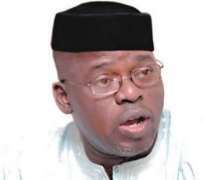 Oni is alleging that Fayemi did on resign his appointment as minister before contesting the APC primary. When the plaintiff found it difficult to serve Fayemi and the APC with the court processes, an order of substituted service was obtained from the court. Already, some foot soldiers of Fayemi have started lambasting Oni on social media and newspapers.